I ordered a new balance shoe on https://www.rainbowsendphysio.com website. It was 75,38 EUR, but the „AIP WINWORLD BEIJING CH” company took away 82,83 EUR from my account. 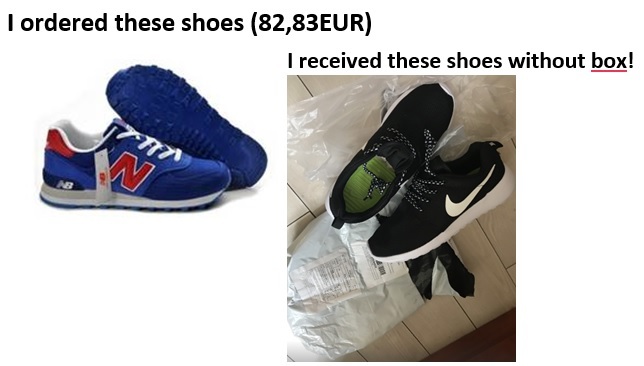 I got a fake NIKE shoe (without box!!) instead of New balance. I wanted to send back the shoe and get back my money, but rainbowsendphysio never answer. I got answer from auto3@safesslbillpay.com, but they always send the same standard text: "We are a payment platform company. You have placed an order from the seller who runs the website via our channel. Your complaint has been accepted and we will push the seller to follow your request asap. Please wait for their response. Thank you." I would like to get back my money.